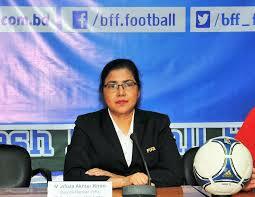 March 20 – A Bangladesh court has decided to grant bail to FIFA council member Mahfuza Akhter Kiron just days after she was arrested for allegedly defaming the country’s Prime Minister Sheikh Hasina for saying nothing more than that she was neglecting football in the cricket-mad country. Kiron, who heads women’s football in her country, was initially refused bail after being arrested for making her comments on a television talk show which, according to her detractors, were derogatory and embarrassed the entire nation. Kiron was elected to the FIFA Council in 2017 and is also a member of the Asian Football Confederation’s Executive Committee and Women’s Committee. Hasina’s administration has recently been accused of cracking down on free speech and adopting an increasingly authoritarian style. But her bail apparently had nothing to do with the fact that FIFA was now watching the case carefully. “The court granted her bail until April 2 … basically on medical grounds as she is receiving cancer treatment,” her lawyer, Liakat Hossain, told Reuters.